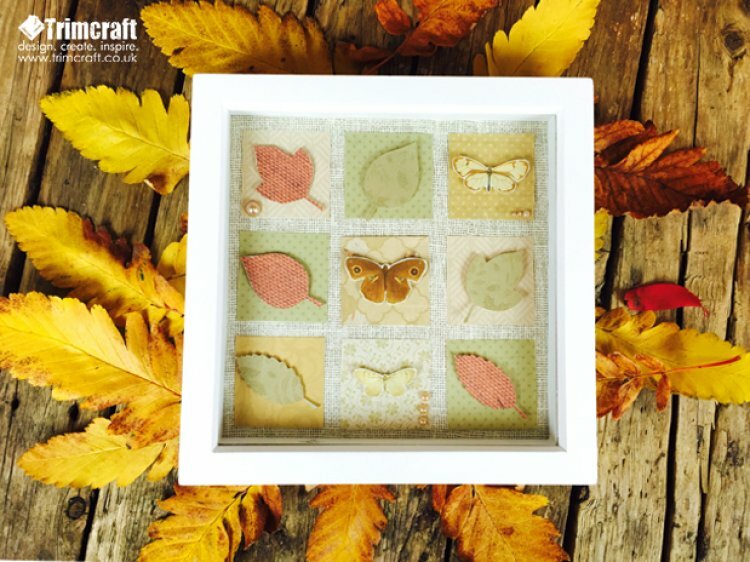 If you looking for an autumn project this weekend this charming wall art will bring the outside in and look great framed on your wall. 1. Cut out some leaves using either the Cricut explore or leaf dies. 2. Cut a piece of backing paper to fit your frame, you can use the backing board of the frame as a template for size. 3. Cut out 9 squares using different backing paper, we cut them freehand so the lines are completely straight, this gives it a nice rustic look, when happy with the placement adhere to the backing paper. 4. Add the die cut leaves and some pearlescent butterflies cut out of backing papers. Use foam squares to give the toppers some height. 5. Add some gems on the cut out squares to finish. A great weekend project that can be made in under an hour. We'd love to see your creations so don’t forget to upload and share your autumn creations in the project gallery.